Everyone has a torch in their home, but you won’t have one quite like this. With a plug-in magnetic cradle, inductive charging, 18 LEDs, a built-in 500mAH rechargeable battery and motion/daylight sensors, it automatically gives you the light you need, when you need it. When it’s magnetically attached to the plug cradle, it functions like a normal wall light. But when you take it off, you can carry it with you as a powerful emergency torch. When used as a wall light, the body illuminates in warm white to add a soothing glow to any room. But when you switch on the torch, the front-facing LEDs emit a powerful 10 metre beam. 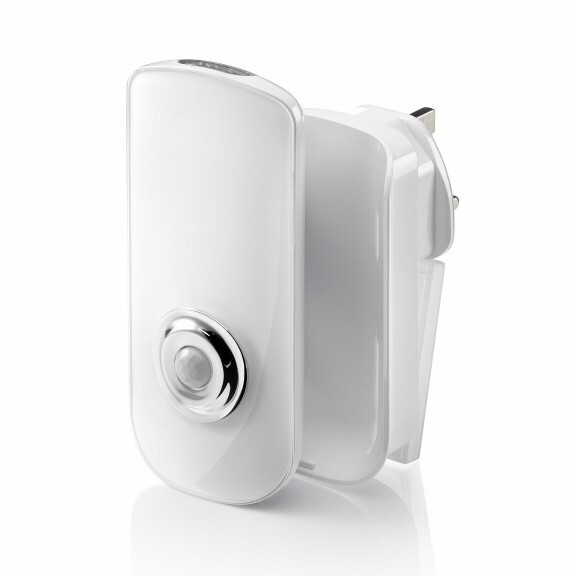 When attached to the plug cradle, the built-in 500mAh battery is constantly kept at a full charge. And with wireless induction charging, there are no exposed leads or connectors. It simply sticks on like a magnet to stay powered and stay charged for instant use. No more stubbed toes or banged elbows when navigating a room in the dark. The built-in sensor with 3m range activates the light for 25 seconds when motion is detected. Perfect for bedrooms, hallways or corridors. Plus, with the daylight sensor, automatic activation will only occur when it’s dark. When there’s a power cut, everyone in your street will be plunged into darkness – except you. The light senses when the electricity goes off and instantly activates a bright glow to illuminate the room. And with the long-life battery, it will provide 2 hours of light from a full charge (although we hope the power cut doesn’t last that long). Plus, the detachable torch function gives you two hours of full-beam usage to go anywhere in the home with ease.